Anyone who knows me will know that I am obsessed with any and everything 1940’s. Women during this time seemed to look effortlessly classy and glamorous despite the difficulties of living in wartime Britain (or anywhere else for that matter). My obsession started when, as a little girl, I realised that my Grandparents where alive during the war. I would ask them all sorts of questions about their experiences and loved hearing everything they could share with me, from how my Grandfather helped his Grandfather build their air raid shelter to how my Grandmother would watch her Mother draw a line on her calves instead of wearing stockings. My Grandmother would and still does tell me stories about her childhood and she always seems to remember exactly what she was wearing. She describes her outfits in great detail, creating a vivid image in my head and always ends her description with ‘Oh, I thought it was marvellous’. Given my obsession with 40’s fashion you can understand how pleased I was when celebrities started posing on the red carpet wearing PEPLUMS!!! The 40’s were all about curves. 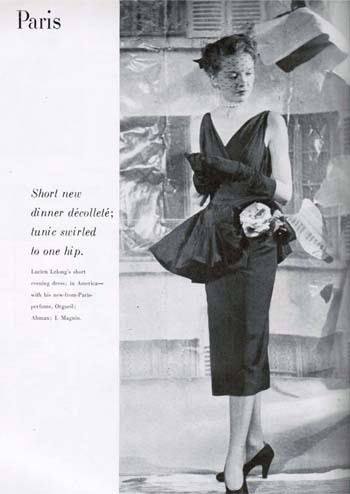 Clothes were made for women with curves or to create the illusion of the perfect hourglass and the gathered, flared material around the waist of a peplum does exactly this. So you know what a peplum is but how do you wear it? I read somewhere that because the peplum is already a statement piece then you should not colour clash or team it with any patterns! Rubbish! As far as I am concerned there are no rules when it comes to colour or patterns. One thing you do need to remember when rocking a peplum is that it is designed to show off those womanly curves. If you are wearing a peplum top then team it with a pencil skirt or a pair of skinny jeans to avoid it looking too fussy and loosing that hourglass shape. When wearing a peplum skirt you can team it with a strapless bodycon top for a glam evening look or dress it down with a jersey top for a daytime look. As with any look, remember to have fun and experiment - the peplum is both quirky and glam, vintage and modern and can be worn day or night. I asked my grandmother the other day whether she ever wore peplums as a young girl, partly hoping she still had one or two pieces stashed away in her wardrobe. ‘You’ll have to show me what a pep....peplum is’. I ran up to the small bedroom I stay in when visiting my grandparents and grabbed my purple peplum top. ‘Oh, a frill! I had a coat with a frill going around my waist as a girl. Oh, I thought it was marvellous’.